Mary Lane:“Imaging the Self”. . . While time and different aspects of one’s personality might be presented over a series of images, Margaret Sunday, in “penelope dissembling in frackutopia” weaves a series of strips and assembles them in order to create her self-portrait. The strips build up in a geologic, sedimentary fashion: references to local fracking; a compromised skeleton; a drawing of a cast of her face from an earlier age. The montage of past and present, of environmental and physical factors creates a multi-dimensional representation of the influences that determine who she is. Her hand, the instrument of her labor, breaks free from the top edge in a gesture that suggests she is waiting to receive something. Wisdom from Penelope’s perseverance in the face of adversity? Self-knowledge? Perhaps it is the human induced seismic activity that has produced this fractured fairy tale. 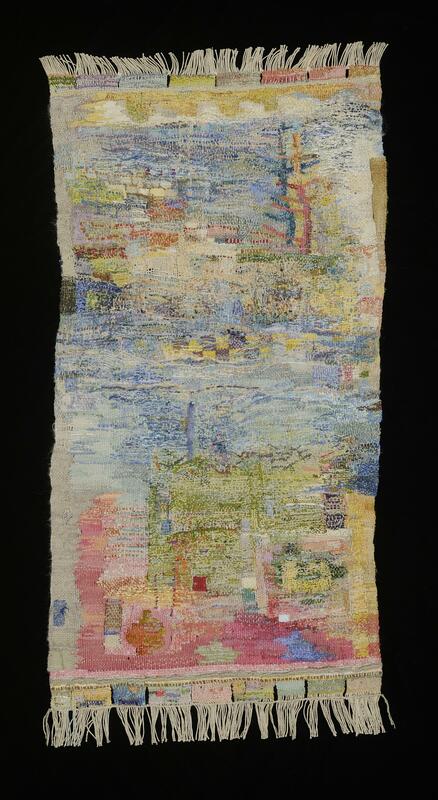 Kathy Spoering: “Small Tapestry International II: Passages” . . . The one presentation that most caught my eye is … Margaret Sunday’s “A Transect Through the Enchanted Wood.” The tapestry is only 9 1/2 x 7”, yet the mount makes the piece the largest in the exhibit, perhaps 20 x 20”. At first, I wondered if there had been a size limitation that this piece might have gone beyond, but if so, I am glad it was allowed in this way anyway. All surfaces of the frame and mount are covered with a neutral white fabric, emphasizing that this is a fiber piece, and making the mount an integral part of the piece. 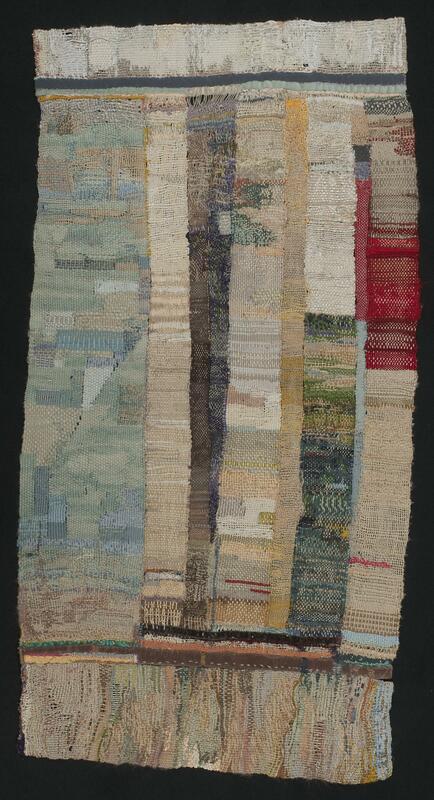 The tapestry is hung within a shape that mirrors the eccentric shape of the tapestry itself. The entire tapestry is woven in a somewhat eccentric manner, with warp showing through, edges curving, holes peeking here and there, and no real apparent plan to the image. Sunday explains that the inspiration was a walk her daughter had taken in an ‘enchanted’ wood that included fairy sightings. I have to say, I believe in fairies, based on this little tapestry. It is a visual surprise and delight! 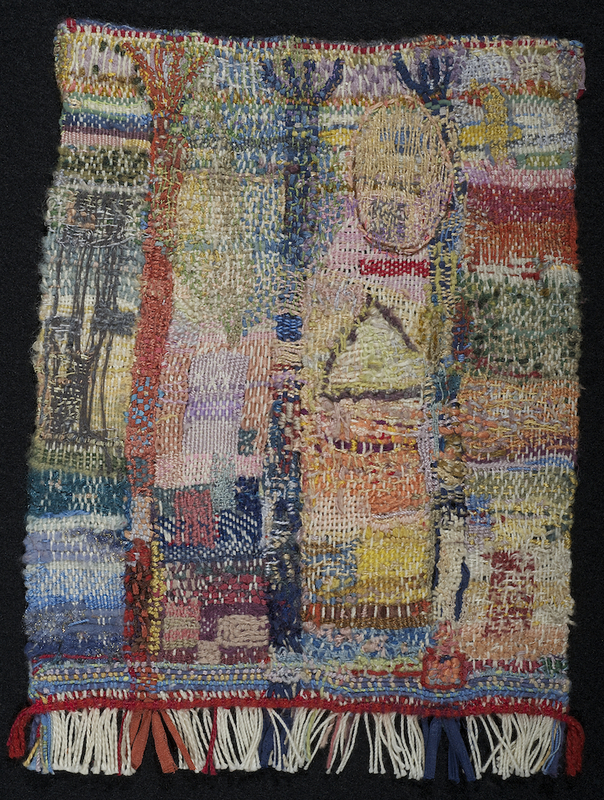 In spite of, or perhaps because of, all the ‘broken technical rules’ in the execution of this tapestry, it is the one that will stay with me long after the exhibit is over.